2011, Warner Bros. Pictures. Directed by Zack Snyder. PG13. 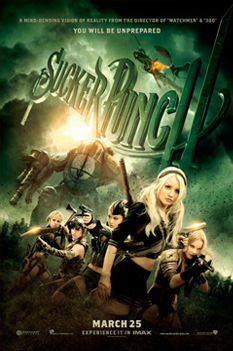 Starring: Emily Browning, Abbie Cornish and Jena Malone. Mathew: What? What are you talking about? This film was jaw droppingly amazing! Helm: T'was jaw droppingly bad. I cannot believe you wore me to this movie. Mathew: Dude! Are you talking about the same movie I am? Did you miss the freaking massive battles with dragons, zombie soldiers and giant robot samurai versus girls who were basically just wearing underpants? Helm: From your description, if not your praise, we speak of the same bit of trash. Mathew: Helm, now come on. This was a master work of cinematic genius. Zack Snyder is the visionary who brought us 300, The Watchmen and The Guardians of Ga'Hoole. Helm: 300 was a fine film. The Watchmen was visually stunning but only a passable film. The Guardians of Ga'Hoole still enrages me for its divergence from the book series. Sucker Punch seems to cement a downward spiral, like water going down a drain. It is a dark and dreary awful mess that illustrates the folly of giving a film director too much creative control, too much money and too much praise for his use of super slow-motion. Mathew: I don't know what your talking about. This film was both a stunning visual tour de force and a mind-bending journey into a mentally unstable girl's twisted vision. Helm: Blather blather blather. Sucker Punch was a pointless and addlebrained mess. It was also a painful waste of my time that caused me to feel each second of the film as a theft of a second of my own life--and that is saying something as I am effectively immortal. Mathew: Look, don't get all melodramatic. Helm: I cannot. Zack Snyder has used up the entire supply of existing melodrama in the universe. Mathew: How can you not like this film? Think of the explosions! Think of the sword fighting! Think of the nubile young ladies leaping around in their anime school-girl outfits! Helm: I was singularly unmoved by these elements. In fact, before seeing this film, I distinctly recall your strumpet of a girlfriend repeatedly decrying it as a sexist exercise in violent, misogynistic titillation (all elements that seemed sure to make it a crashing good time) and yet I was not once excited or aroused in the slightest degree. She was, as usual, completely wrong and the film was, unexpectedly, completely boring. Mathew: Look. I don't care what you think because you are wrong. I'm going to give this film five flaming swords so that even if you only give it one sword it will still average out to three flamers and people will see it! Take that! Mathew: That is totally not fair! There are no "frozen swords"! Helm: You are mistaken. There are five. And that leaves the total flaming swords for this review at ZERO.